So what’s the fuss about? Why do tour buses deposit more camera toting sightseers than fish trapped on Lake Tonle Sap’s shore when the water recedes? In the prior post on Banteay Srei, we saw some of its uniquely beautiful style. We’ll now enter it more deeply and explore some if its inner mysteries. 1. You proceed to Banteay Srei on a straight causeway that approaches it from the east. 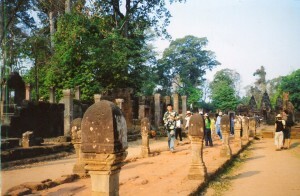 A causeway also leads to the central towers at Angkor Wat. But what a difference. Banteay Srei’s is small and intimate, and Angkor Wat’s is sensational. Both are arrow-straight, but Banteay Srei uses this symmetry not to awe people with the king’s power, but to enhance a more gentle piety. 2. 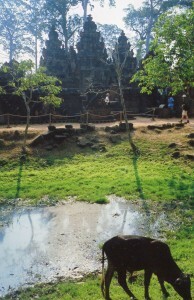 A moat once surrounded the temple. Like Lolei and Prasat Kravan, Banteay Srei once sparkled in the middle of limpid waters. The cow in the first picture seems oblivious to the heritage she grazes by. 3. Now we have some action! 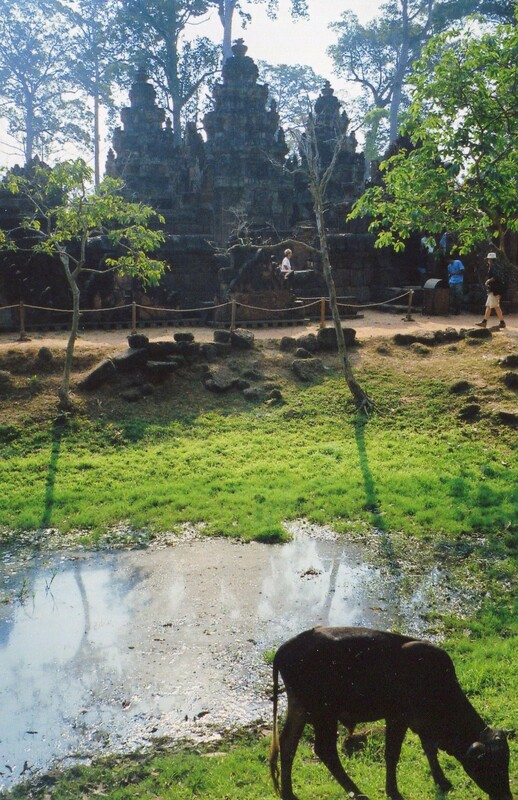 The Khmers loved lively scenes, and India provided material that matched the monsoons’ abundance. Here, Vishnu has assumed one of his 10 incarnations. He’s Narasimha, a lion who conquers some of the world’s most obnoxious beasts. Can he come to Wall Street today? Here, an asura (demon) king called Hiranyakasipu gets the business end of his fangs. This idea follows the Khmer tradition of identifying the king with Hindu gods and thereby bolstering his image as a pillar of order. 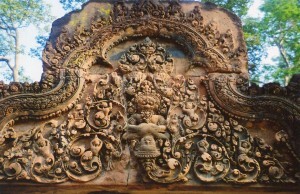 But Banteay Srei projects this motif with new standards of realism and elegance. Banteay Srei is full of carvings that bring new realism to the traditional love of action. 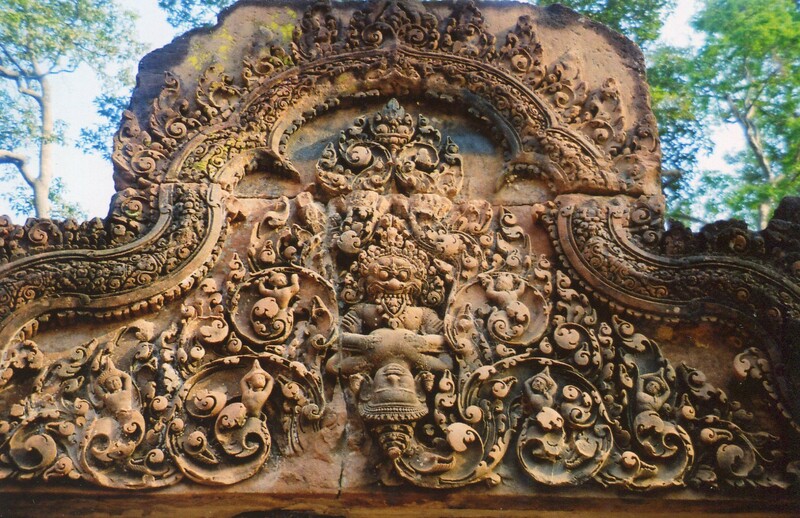 Mix this advancement in sculpture with the temple’s unearthly elegance, and you have plenty of reasons to conclude that Banteay Srei is a great work of art. But we haven’t seen its center yet. In the final post, Banteay Srei, we’ll discover more reasons why lingering at Banteay Srei creates memories that will last a lifetime. Previous post: Banteay Srei, The Most Beautiful Khmer Temple?